The oil hardened potato slices benefited in the crunch stakes from the hand cooked frying method, as the crunch was sustained throughout the Crisp's demise. Which, it has to be said, took a lot longer than most regular cut Crisps. If a Crisp lived in a dark cave, with sharp, jagged walls to bump into, no mirror and little care for appearance, it might look like this characterful splendour. There were crusty oil boils, some broken, some intact. There were curls, bends and rugged edges. The colour was a combination of of oil soaked transparency, medium darkness yellow, reds, browns, plus there was lots of seasoning dotted about. A Nose Plunge Test revealed a stout, maybe even best bitter aroma. The taste followed up in a similar vein. It was almost like biting into a warm and crusty steak and ale pie. 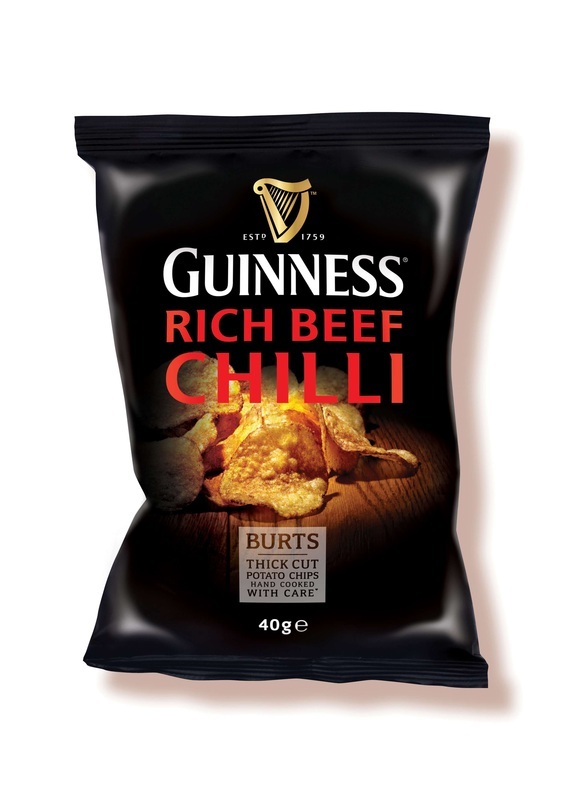 There appeared to be less Guinness flavouring than the other flavour in the range, but there was certainly a beefy, meaty, well seasoned taste, with a hint of onion and pepper. It did well to avoid the simple beef stock flavouring of many Beef Crisps, and instead posed as an original and worthy addition to a range we would certainly like to see expand.